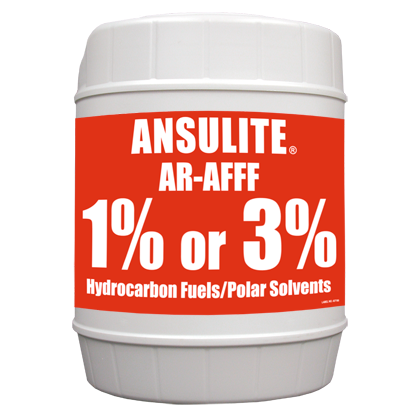 ANSULITE Alcohol-Resistant Aqueous Film-Forming Foam (AR-AFFF) Concentrates produce a foam that is effective on hydrocarbon fuels as well as fuels such as methanol (methyl alcohol), ethanol (ethyl alcohol) and acetone which have appreciable water solubility or miscibility. AR-AFFF exhibits the best cross-functional performance for flame knock-down, burnback resistance, extended vapor suppression, manufacturing and proportioning consistency, and the longest potential shelf life. 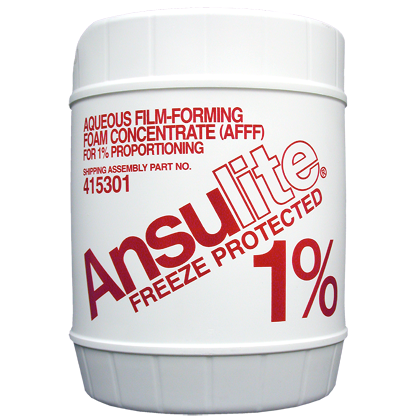 ANSULITE Aqueous Film-Forming Foam (AFFF) can be applied through a wide variety of delivery systems which provides extreme versatility. The foam is an ideal fire suppression choice for airports, refineries, manufacturing plants, municipal fire departments, and other operations involving the transportation, processing, or handling of flammable liquids. 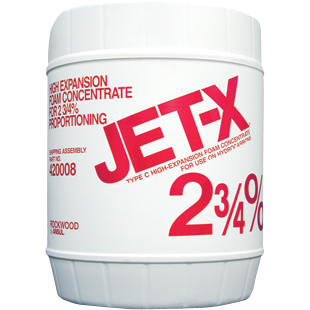 JET-X High-Expansion Foam Concentrates are flexible firefighting agents, used in fighting Class A, Class B, and LNG fires both indoors and outdoors. 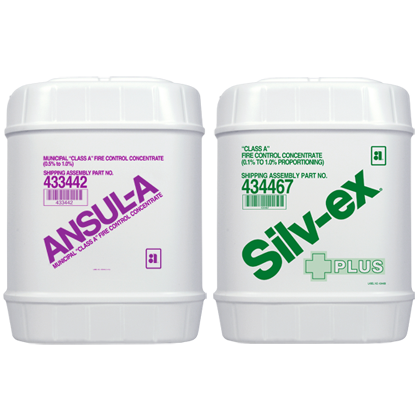 Expansion ratios from 50:1 up to 1000:1 make them suitable for a variety of applications including aircraft hangars, flammable liquid storage areas and LNG facilities. Class A foam agents are specifically designed to combat fires involving ordinary combustible materials, like wood, paper, coal, rubber, and plastics by making water more effective. The agents reduce the surface tension of water providing superior wetting and penetrating characteristics. This allows the solution to penetrate deep into the char of deep seated fires, promoting cooling and making the Class A fuel less combustible. The expanded foam solutions also create a dense foam blanket that provides an insulating barrier between the fuel and the air. For the suppression of fire involving hydrocarbon bulk storage and handling, such as refineries and petrochemical facilities, fluoroprotein foam concentrates are ideal. For the suppression of fire involving hydrocarbon bulk storage and handling, such as refineries and petrochemical facilities, protein foam concentrates are ideal. 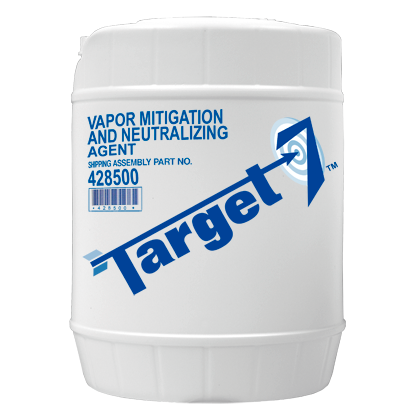 TARGET-7 Vapor Mitigation and Neutralizing Agent allows for a one-step application to both lessen dangerous vapor release from a spill and neutralize the spilled material. When mixed with the appropriate neutralizing agent, the TARGET-7 agent is able to perform this task in one step. This is critical when time is of the essence after a dangerous spill of fuming acid or other hazardous chemicals. 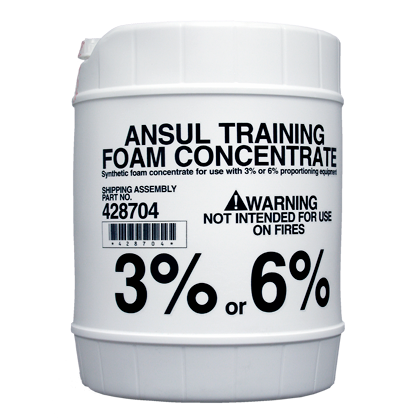 Training Foam is not intended for live fire training or for actual firefighting operations. It is functional in any proportioning and generating equipment and minimizes the effects of training on the environment.